G7 Entertainment Marketing, based in Nashville and part of the Project Worldwide Group have teamed up with Kru Live Staffing to support their activation of Keds the US shoe brand. Keds has a multi-year licensing deal with Taylor Swift for limited edition Keds and wanted to extend their alignment to her 61 date RED tour in the US with additional legs in Europe and Asia. The objectives were to reinforce that Keds is a fashion brand, create an activation that generates social media buzz and debut the new RED Taylor shoe. 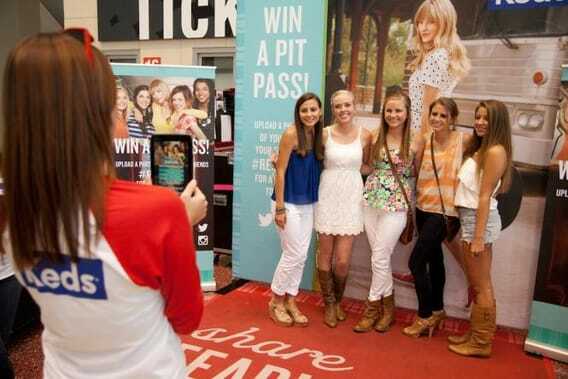 Digital kiosks collect fan info and style preferences for email marketing post-show and provide a “spin the wheel” instant win game tactic to award free shoes, RED tour shoelaces, magnets and discount coupons. “Brave Girls” photo marketing in which fans share poster messages as to what makes them brave/fearless. Photos are pushed to fan emails for viral sharing. Kru Live have so far completed successful team placements in Shanghai, Tokyo and Manilla on the Red Asia tour with Kuala Lumpor and Singapore remaining. Kru Live’s MD, Tom Eatenton said we are very pleased to firstly have been recommended to G7 by our London based client George P Johnson (also part of the Project Worldwide Group), but also to have successfully developed this partnership across the world following the strength of our European support. This programme of events truly demonstrates the capability of our international offering through our reliable collective network.